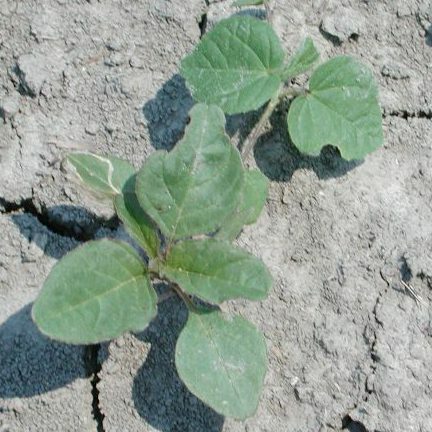 Weed size is critical when timing herbicide applications, but do you know how long it takes for a weed to go from almost too small to see – to too big to kill? Here’s a visual example. To begin, the plot was cleared of weeds, without disturbing the soil surface. CHUs (Crop Heat Units) and GDDs (Growing Degree Days) were calculated based on soil temperatures (in Celcius), using a base temperature of 2°C. On an average day in early spring, only 0 to 20 soil temperature GDDs may accumulate per day, but on warm sunny days when 30-50 GDDs could accumulate per day, the weeds could get ahead of you very quickly. For example, the difference between the first and second photos, 150 soil temperature CHUs or 225 GDDs, could be over 22 days (at 10 GDDs accumulated per day) or 5 days (at 45 GDDs accumulated per day). The difference between photos 3 and 4 is 200 CHUs or 250 GDDs. This is a difference of 25 days at 10 GDDs per day, but at 45 GDDs per day, this growth could occur in less than 6 days. Remember, these calculations are based on soil temperature, while the typical CHU or GDD accumulations reported from weather stations would be based on air temperatures.